Although we are largely about dogs here at All Things Dog Blog, we have a history of pets of all sorts: Peekaboo the parakeet, too many cats to count, hamsters and guinea pigs, and yes, even a rabbit. Robby was adopted by Marc some 8 or 9 years ago; I'm losing track. With Easter fast approaching, we know that some families may choose to bring a bunny home to live with them. We love Robby and successfully integrated him into a 3-dog and 1-cat family with 3 kids--the large breed variety! This may not be the case for all families, though, so we'd like to help you make this choice wisely. If you have a dog with a high prey drive, think twice. Ask questions. Consider a rabbit's housing options for his safety as well as the ability to get some exercise. Adopting a rabbit if you already have a small breed, very young puppy or kitten, may make for a better pack relationship. However, for their safety, I would not recommend the smaller rabbit breeds. In addition, there are certain dog breeds that may never do well with a rabbit. For instance, Terriers may present a particularly tough challenge. Be sure to tell the adoption group about your other pets. Give your new pack mates separate playtime when you cannot continuously supervise. Bunny proof your rabbit's play area, placing all cords and cables under rugs and behind furniture. Remove all soft plastic items from access. Our Robby particularly enjoyed iPod cords and remote control buttons for chew toys ;) so keep that in mind. As I have described in previous posts, your rabbit can be litter trained with patience and appropriate measures of freedom. Read Robby's guest post for more helpful tips on training and diet. If, after all your research, you're still planning to adopt a rabbit, please use a reputable source such as Petfinder. When you visit this site, check the left side to select "rabbit" from the breed area, and then choose your city or state. You'll be off and running to find just the bunny of your dreams. Before you adopt, be sure to ask questions and describe your home and family to the rescue workers. Learn as much as you can about the care and health of your new wiggly-nosed friend. Carrie - thanks for the advice to people who are considering adopting a rabbit. You know how much I love BJC, but people do need to give serious thought to a rabbit's needs before getting one. Too many end up in shelters or turned loose. I'll be back next week for the Bunny Blog Hop! Terrific and timely post. 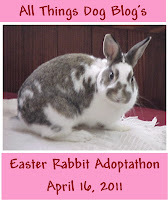 Far too many bunnies, ducklings, and chicks are adopted at Easter, then neglected or abandoned soon after. I've signed on as your newest follower, and would love it if you could do the same over at Critter Alley! What a fun blog! Thanks for visiting us at ours. It's nice getting to know new friends. We look forward to your posts! Can't wait for the Easter Rabit Blog Hop!!! Wonderful post. I would love a bunny but Cocoa & Oreo would be a little jealous. Not everyone would agree with me but I'd suggest that people not make a pet a surprise gift. Everybody in the family needs to be on board with the decision. Let's hope your post puts all Easter bunnies in forever homes! Stopping by on the Saturday Blog Hop. Hi, found u in one of our friend's blogs and came by to say 'Hello'. You have a wonderful blog going. Hope loads of our hopper friends find furever homes soon. Great idea Carrie! I'll be joining in. 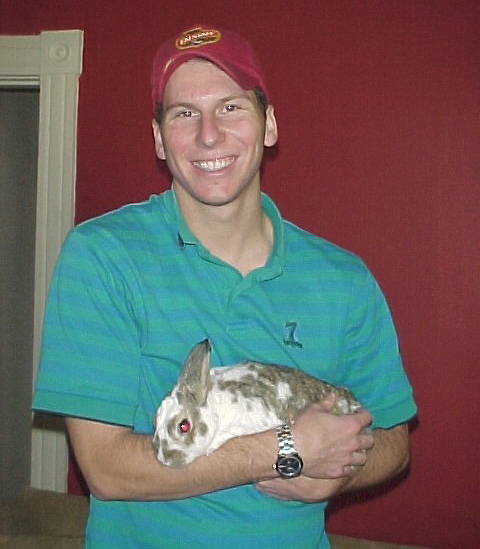 Glee, my current long eared hopper, is my 3rd rescue bunny so I really like to promote the joys of adoption when I can. Pictures....I want pictures. Post Glee to my FB page, pleeeeze! A rabbit blog hop! Love it! This adoptathon is such a wonderful idea!